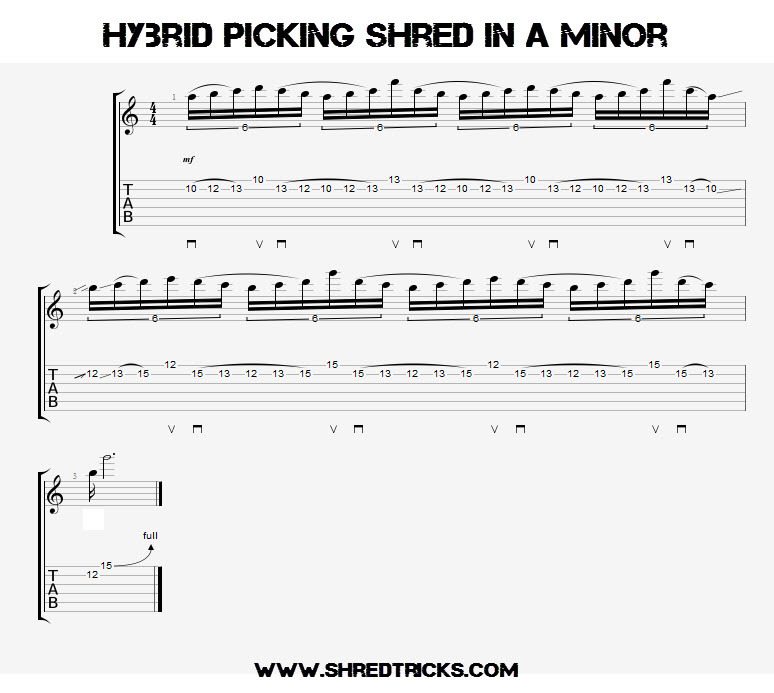 Hybrid Picking Shred in A Minor Lick - . :Shred Tricks - Shred Guitar Lessons by Eric Maldonado:. Here is a sick Hybrid picking shred lick in A Minor. Every single high E string note is going to be plucked with your finger(I use my middle finger). So each note that is notated with a V under it, is going to be plucked with your finger. The trick here is to get the rolling technique down. Basically it is just getting those 2 high strings in sync and barring them on the 2nd note that is plucked with the finger(i.e. 13th fret E, and 15th fret E). Now, I put a bend in at the end of this lick but you can keep going up the scale or wind this lick as much as you want(meaning to repeat the 2 patterns).